They even had the seats and everything in there. The seams were all torn but overall still in pretty good shape. The green/blue panels had green seats. The solid blue panel one had blue seats. I also came across several what I call "ivory" interiors which are the white interior with oval burl wood inserts on the door panels. Sorry I forgot to get pics. But if you want me to pull door pa els and ship them to you let me know. Lots of good stuff there. Both are proverbial Hen's Teeth! I would ask that you save both but currently I am tapped out financially due to this current door panel project. OK, I went outside and yelled for a few minutes. I feel better. 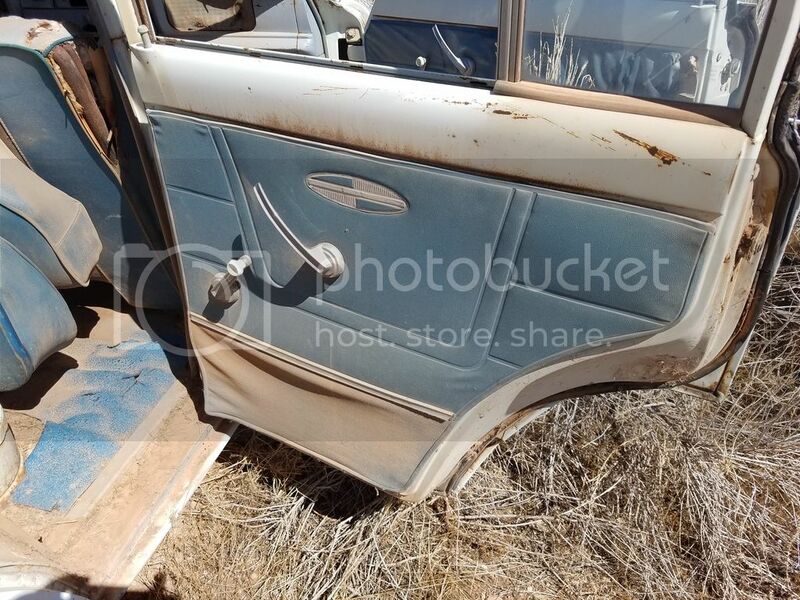 Can you give me an idea what it would cost me to have you save the front and rear panels on one side from both vehicles, strip the vinyl from the backing board and ship them to 95621? I have a stack of panels of various years after my recent trip to my Dad's place in Montana but both of those versions are missing from my pattern collection Dustin. Ya i can do that. The pure blue interior with that saddle pattern is a cherokee. Do you still want the rear panel too? The panels shouldn't cost too much. I've picked up entire nice FSJ interiors from these guys for $200 before. So they'll probably be super cheap. I'm in favor of what yourelse doing so I won't charge labor. I'll let you know what shipping runs. 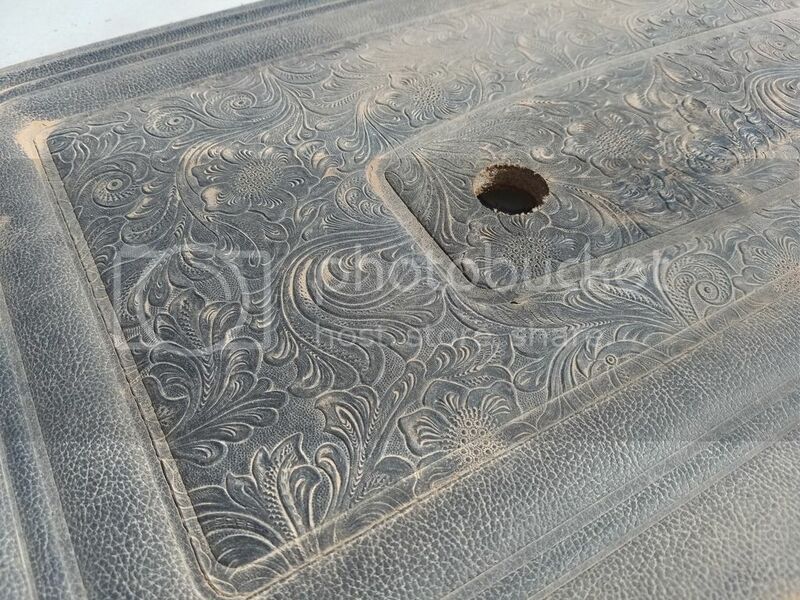 I don't need the rear panels on the Cherokee, but a good photo would be great. Since the panels have poor vinyl I am hoping you can get them reasonably. I'll figure out what to sell to pay for it. PS: I emailed Chip at Wagonmaster about possibly making the GW panel repro's for him if he's running out of good originals. Oh, and of course, for helping me out, I would offer a set for your rig at cost if things work out. I owe Nightglide a pair of Gill panels for his J-truck just to get some exposure so another set wouldn't kill me. How does the rest of that Cherokee look? 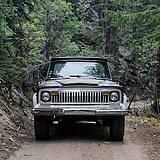 I need a rust free 74-75 Cherokee body real bad. All 74-75's are narrowtrack. That's why I like them. Very interesting. Learn something new every day. Tatsadasayago wrote: The foil look is easy to achieve. It's those horizontal embossed lines and logo that will be a pain to reproduce. I'm not picky and I'm definitely not prissy. Whatever is the easiest to make is fine with me. I already have the proper arm rest and chrome strips for my current style so something matching those is fine. So are you looking into making multiple styles or just the late 70's to early 80's style? Dr. Marneaus wrote: So are you looking into making multiple styles or just the late 70's to early 80's style? My plan is to eventually make repro panels, seat covers and possibly dash pads for all the years. I chose the Gill version to do first because that's what my Chief has plus it's the 2nd longest running version we have for the FSJ. I'll be sewing the pieces together over the next day or so and doing the first pressing by the end of the week and looking forward to it after all this time and effort. Tatsadasayago wrote: Yeah, I've been to Schindlers and saw their stuff. I think their Laredo pattern vinyl is made by Mitchell. Having access to a full OEM 74 S set of panels would be very helpful. I have a full uncut set from front door to tailgate you can use, ill just need them back at some point. The vinyl is in good shape but the fiberboard behind it all is done. If you need pictures just let me know, I'm about an hour south of you in Turlock if your ever this way your welcome to use my shop for layout/dimensions. You would get a new set of backer panels out of it too! I'll keep this in mind for when I get the Gill versions in production.